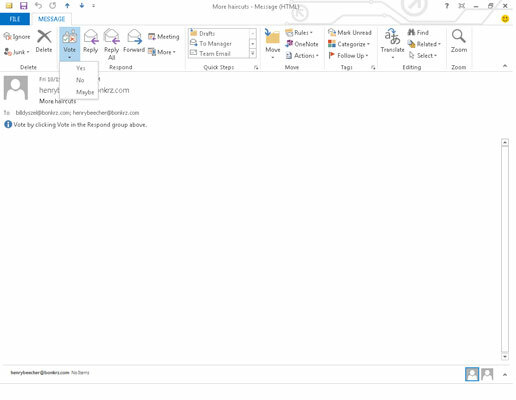 You can use Outlook 2013 as a decision-making tool if you take advantage of the Outlook voting buttons. Management gurus constantly tell us about the importance of good teamwork and decision making. But how do you get a team to make a decision when you can’t find most of the team members most of the time? Voting is a special feature of Outlook e-mail that adds buttons to an e-mail message sent to a group of people. 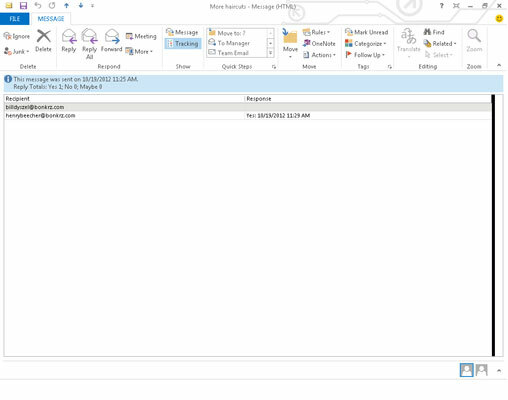 When they get the message and if they are also using Outlook, recipients can click a button to indicate their response. Outlook automatically tallies the responses so that you can see which way the wind is blowing in your office. To add voting buttons to an e-mail message you’re creating, follow these steps while creating your message. With the New Message form open, click the Options tab in the Ribbon and then click the Use Voting Buttons button. If you choose Custom, the Properties dialog box opens. Type your own choices in the Use Voting Buttons text box. Follow the pattern of the suggested choices; just separate your options with a semicolon. If you want to ask people to vote on the lunch menu, for example, include a range of choices such as Pizza;Burgers;Salad. Click the set of voting buttons that you want to use. The message You Have Added Voting Buttons to This Message now appears at the top of your message. If you are adding your own custom choices, however, you’ll need to click the Close button in the Properties dialog box when you are done to return to your message. And there you are! Democracy in action! Isn’t that inspiring? When your recipients get your message, they can click the button of their choice and zoom their preferences to you. When the replies arrive, you’ll see who chose what by looking at a reply’s Subject. Messages from people who chose Approve, for example, start with the word Approve; rejection messages start with the word Reject. Click the Sent Items icon in the Folder list. Your list of sent messages appears. Double-click the message you sent for votes. The message you chose opens. You see the people you’ve asked for a vote and how they voted. A banner at the top of the Tracking page tallies the votes.